The exceptional accuracy, high-speed and ease of use of modern CNC Optical Coordinate Measuring Systems has ensured that this advanced technology has been enthusiastically embraced by a wide range of demanding industries. In addition to users such as the Automotive, Aerospace, Medical and Electronic industries, the multiple advantages these cost effective, non-contact measuring devices provide has also ensured the technologies’ migration into less traditional areas. The recent purchase of an advanced Baty International Venture Plus system by Spear (Europe) Ltd, for its South Wales plant, illustrates the accelerating take up of CNC Optical Coordinate Measuring Systems by the world’s printing and packaging industries. Owned by the Vienna based Constantia Flexibles Group, Spear is the world’s leading innovator and supplier of film pressure-sensitive labelling systems. The company’s labels are found on many of the leading beverage, food and personal care items throughout the world. Spear’s engineered labels are able to withstand pasteurisation, hot fill, retort and ice chests, to allow for label application at any stage of the distribution process. Spear (Europe) Ltd operates from a state-of-the-art 60,000 sq ft, design and manufacturing facility in Cwmbran, South Wales. As with every Spear site, all aspects of the impressive Cwmbran plant’s activities are governed by the group’s culture of total quality. Mindful of the need to uphold the company’s reputation for the quality of its labels, in addition to operating the best available production plant, Spear (Europe) has made substantial investments in advanced quality control equipment. The facility’s latest quality acquisition is a state-of-the-art vision measuring system supplied by Baty International. Spear (Europe) Quality Manager, Gavin Honey explained. “Quality is at the heart of every aspect of Spear’s endeavours. All company facilities are registered to the ISO-9001 standard, in addition, Spear Europe has recently been awarded with the ISO-14001 environmental registration. “As we have an existing manual 2D system, we are fully aware of the many advantages that Optical Measuring Systems provide. Armed with our in-house knowledge of the technology and aware of the technical developments in the field, we recently undertook a search for a more accurate, 3D fully automatic CNC system that could keep pace with our high volume production. 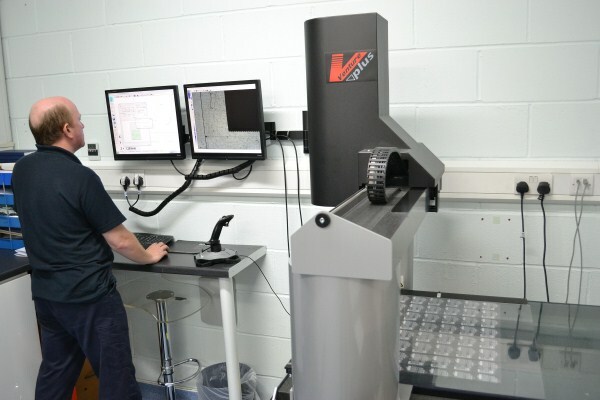 “Having had demonstrations of several alternative makes of CNC-enabled, Optical Coordinate Measuring Systems, we considered the Venture Plus from Baty International to be the most suitable option for our specific needs. Having enjoyed a trouble free installation and training period, our Venture Plus is now fully operational. “As the Baty unit was available in several sizes, we purchased a large bed (640mm x 900mm x 250mm) CNC option, together with the system’s impressive speed of operation; this allows the measurement of multiple labels in a rapid, fully automatic mode. Having opted to purchase a 3D system, we are also now able to capture important data related to embossed labels’ features. “The use of our new Venture Plus has considerably speeded-up our record keeping and analysis functions. Having previously entered information manually, we are now able to export all relevant data to our Excel records at the click of a button. We are now using collected data to perform Statistical Process Control. This invaluable information is then used to further improve the efficiency of our production. Baty International is one of the world's leading manufacturers of Optical Profile Projectors, Vision Measuring Systems and Gauging Products. Baty's product range includes two dimensional (profile measuring) equipment and full 3 dimensional (coordinate measuring) systems. The company’s highly accurate products are used throughout the world, across a wide range of industries including the printing and packaging sectors. Available in a range of capacities, Venture Plus CNC models are able to completely automate the inspection process. Through the use of Baty’s Fusion software, CNC programming is a simple teach and repeat process. By measuring the objective once, a full CNC program is created automatically. The unit’s zoom lens can also be controlled so that magnification changes are recorded into the program. Venture Plus CNC models have an aluminium bridge type construction, this results in low inertia and reduced thermal mass. High quality air bearings are fitted on all axes and a granite Y beam is used for increased accuracy. This arrangement ensures that the machine expands and contracts uniformly with temperature changes, resulting in minimal distortion and subsequent errors. Prevailing ambient temperature can be compensated for within the Fusion software, making the Venture Plus ideal for use on the shop floor. For more information on Baty's Venture 3D vision system click here.